Avant-Garde Afterlife: Space Shortage Inspires New Burial Ideas Urban areas present a problem: how can the dead be interred both respectfully and efficiently? Proposed solutions include vending machine-like vaults, inverted skyscraper cemeteries and glowing pods. Columbia University's DeathLab comes up with new ideas for honoring and storing the dead — like Constellation Park, the design of which is shown here. Welcome to Constellation Park, population 5,000. 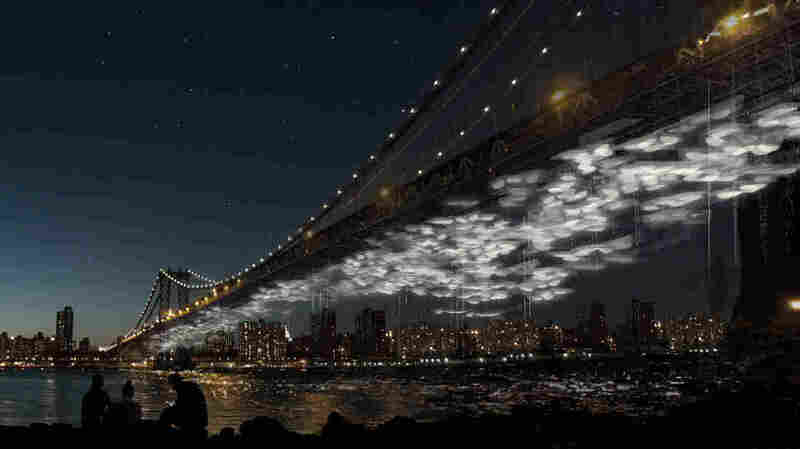 But everyone here — suspended in hanging vessels under New York's Manhattan Bridge — is dead. It's not the set of a dystopian film, but rather a proposed solution to a problem faced by cities around the world: Where can the urban dead rest in peace these days? Constellation Park is one of several concepts by DeathLab, a Columbia University-based research and design space focused on "re-conceiving how we live with death in the metropolis." This group of researchers and architects are quietly working on ideas that include a looming tower that that holds "pods" (i.e., graves) that light up and above which people can stroll, and a spaceship-like structure on Manhattan's waterfront that's like a park where the waking can slip in and out. "We are running out of space," says Karla Rothstein, a Columbia professor who is part of DeathLab. It's not just a New York problem, she says: "It's happening all over the world." Fantastical as these designs sound, cities are being forced to rethink how to — affordably — bury their dead as they grapple with growing populations, soaring funeral costs, limited plots of land reserved for new graves and, of course, the fact that we're all going to die at some point (At least for now). Some have already toyed with creative solutions, like Meguro Anyoin, a Buddhist temple in Tokyo, where, a spokesperson says vaults large enough to hold the urns of 7,200 families are stored in a massive warehouse developed by the carmaker Toyota. (After mourners punch in a code, a small urn with a person's remains pops out of a slot, rather like a soda from a vending machine.) "Vertical cemeteries" in Norway and Iraq ensure locals can be buried where they grew up, while designers in Mexico City are working on an 820-foot-deep, underground "Tower for the Dead" — basically an inverted skyscraper cemetery. Of course, many of these deathly dreams are far from perfectly realized — or even partly realized — and some concepts might not come to life in time for us to avail ourselves. To do so, they'll have to overcome a skeptical public, longstanding rituals and the funeral industry, which in the U.S. is projected to reach $16.2 billion in revenues this year. "This is not reality," says Keith Senko, a Brooklyn funeral director who's been in the business for more than 40 years. During that time, death rites have become more celebratory, but tradition is hard to beat: "Even when it's not sectarian, they follow the basic plan, whether it's a burial or cremation," says Senko. DeathLab is not the only one trying to reimagine the sector. Promessa, a small company in Sweden, is at the forefront of a new and, it says, improved alternative to cremation, in which a corpse is sprayed with liquid nitrogen until it is frozen and very brittle. The body is then vibrated so vigorously that it disintegrates into ashes within minutes — much like the demise of a certain villain in an Indiana Jones film. (You know, the one who failed at his attempt to become immortal.) The company says it already has agreements as well as actual orders from countries including the United Kingdom, Germany, South Korea and Spain to lease its so-called Promator technology. However, even if DeathLab got Constellation Park built, it would have capacity for only about 10 percent of those who die each year in the Big Apple. Meanwhile, a spokesperson for Anyoin Temple in Japan says it, too, is being squeezed for space and is considering expanding. And while Promessa's process costs around $500, compared with up to thousands of dollars for a standard burial or cremation at a funeral home, it has not yet been used on human corpses, nor has it been approved for use in many countries. Even so, some people are keen to be remembered in a new, unique way. As morbid as it might seem, April White, a 31-year-old nursing student from Rock Hill, S.C., keeps bringing up Promessa's process to her family — "and they all think I'm crazy," she says. What's more conventional, though, is that she wants her remains returned to her family to help fertilize a favorite flower or tree.